Are you interested in moving your PowerPoint presentation from mundane to spectacular? It may be easier than you think. PowerPoint has a variety of tools built in that will help you do this. Most users never take the time to learn PowerPoint and subsequently create second-rate presentations. 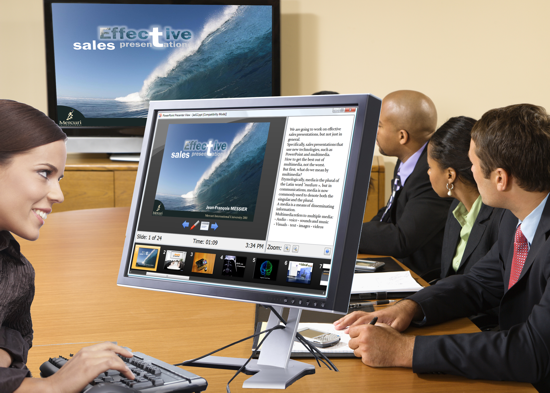 Presenter view allows you to see a different set of images and information than what you are showing your audiences. Imagine giving a presentation and while your audience is viewing your slide, you are able to quickly scan through the entire show or read your slide notes. Best of all, this is not an add-on or app – it is in the program you are running right now! The controls (buttons and icons) are all large so you can easily navigate even while speaking and using unfamiliar equipment. Presenter view works on most current operating system that supports multiple displays including Microsoft Windows® 98, Microsoft Windows 2000, and Microsoft Windows XP or later. Your audience sees one thing and you see another. In PowerPoint, on the Slide Show menu, click “Set Up Show”. Under “Multiple Monitors”, select the “Show Presenter View” check box. Go to Control Panel, click on the display icon. Under “Settings”, click on “Multi-monitors” and select the monitor you want your “show” to appear in. When you start your show, your show will be projected on the monitor (or screen) you selected while presenter mode will appear on your desktop. It is really that simple! Imagine the possibilities! iSpeakEASY offers coaching and workshops to help you create and deliver spectacular presentations with PowerPoint. Call today to ask about “PowerPoint: The Basics You Never Learned”. This speaking tip is one in a series provided to you by iSpeakEASY. Call for information on individual coaching or group training.